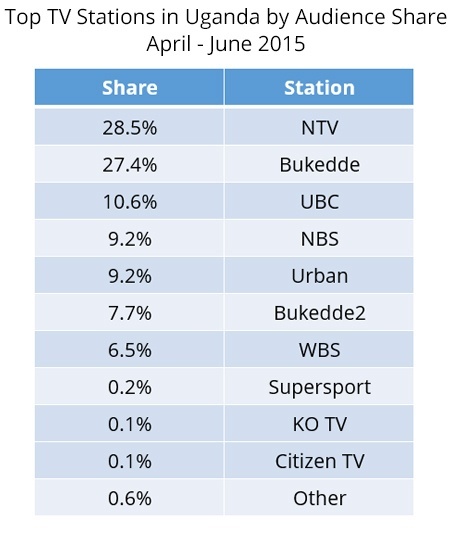 Using the daily data collected through GeoPoll’s Media Measurement Service, GeoPoll has analyzed the top TV stations in Uganda for Q2 of 2015, April 1st – June 30th. 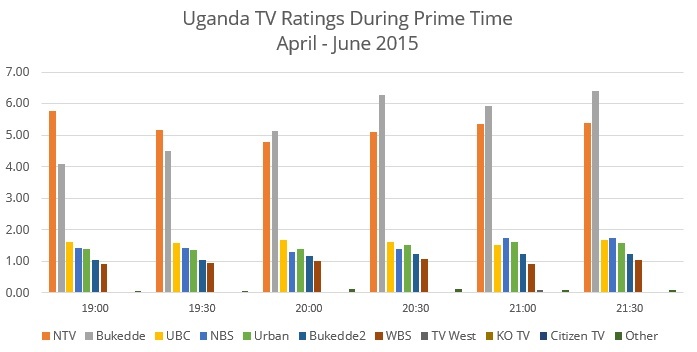 We examined both TV ratings* and share** for the top stations in Uganda. The below chart shows the average TV ratings in Uganda for the top 10 stations during prime time from 19:00 to 21:30. As displayed in the above chart, NTV shows high ratings from 19:00 to 19:30, when they air the news show ‘Akawungeezi’. Bukedde TV picks up from 20:00 and has the highest ratings during prime time at 20:30 when a popular soap ‘It might be you’ airs. For comparison, below is the share we observed for Q1. UBC, NBS and Urban TV experienced a decrease in share from Q1 to Q2. 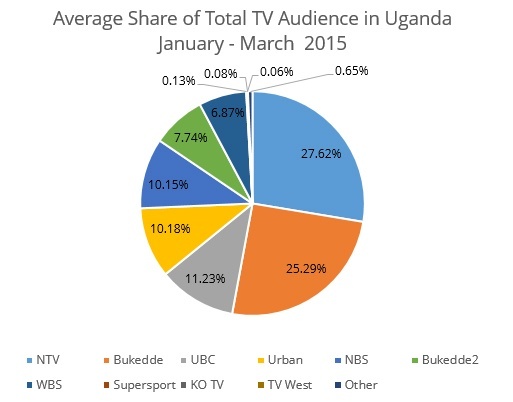 NTV and Bukedde experienced a slight increase in their share. On June 15, the Uganda Communications Commission (UCC) started a phased switch-off of analogue television, starting with Kampala and areas within a radius of 60 kilometres. We expect to see a change in ratings and share in Q3, which we will again share on the GeoPoll blog.